Illumination has been increased while simultaneously reducing power consumption through the use of LED bulbs. Direct sunlight used to be essential for solar light to work efficiently. The latest solar technology is more efficient at harvesting energy. In the coming months and years solar technology will continue to advance. There are many different types of solar lights. Wall lighting: Lantern Style. Hanging or fixed post lighting. Strings of fairy lights in different designs. Deck lighting which is designed to recess so it sits flush with the deck timber. Solar security lighting with PIR motion sensors. Remote solar panels allow positioning of the panel to best catch the maximum light. Other light units contain a built in panel for gathering energy. 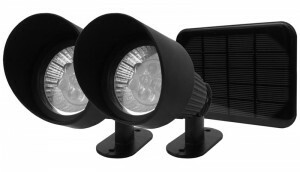 It will depend on where you intend to position the spotlights as to which design is the best design for you. External panels however are usually larger, but because they include wires are more laborious to install. Solar light performance can often be dramatically improved by replacing the factory fitted rechargeable batteries that come with your light units. Your solar lights will work better and for longer with high quality batteries fitted. The performance of your lights will be governed by where they are located. Ideally, place your lights to get the maximum direct sunlight per day. Too much shade for your lights will reduce their performance significantly. Shade and shadows will reduce the lights performance so try to position your lights in unshaded locations. Battery and solar panel technologies are the two areas that will further improve solar lighting performance. The annual sales of renewable energy solar products rises each year and is set to continue to do so. Solar power is popular because it helps to reduce your energy costs as well as reducing your impact on the planets resources.